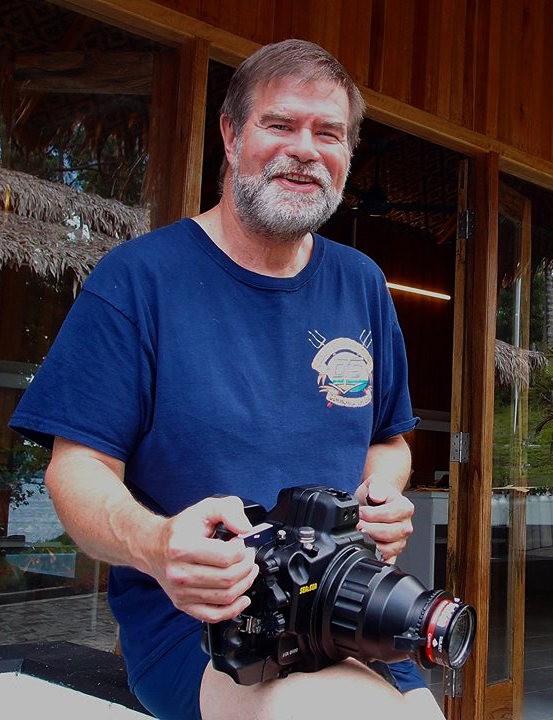 A “newbie” photographers experience with the Sony RX100 II with the Sea and Sea MDX housing. 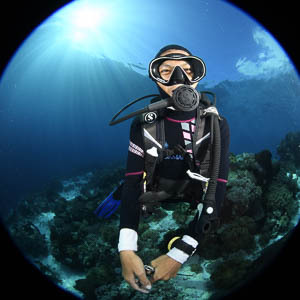 I recently got a chance to shoot the Sony RX100 2 in a Sea and Sea MDX housing for a week during a live-aboard photo expedition in Mexico’s Sea of Cortez. During the trip I got a chance to use the set up in a variety of different conditions and arrays. It was a big step up for me, first time using a new camera, new housing, dual strobes, wide angle and macro lenses and had it’s share of frustrations but in all a huge improvement over my G10 set up. 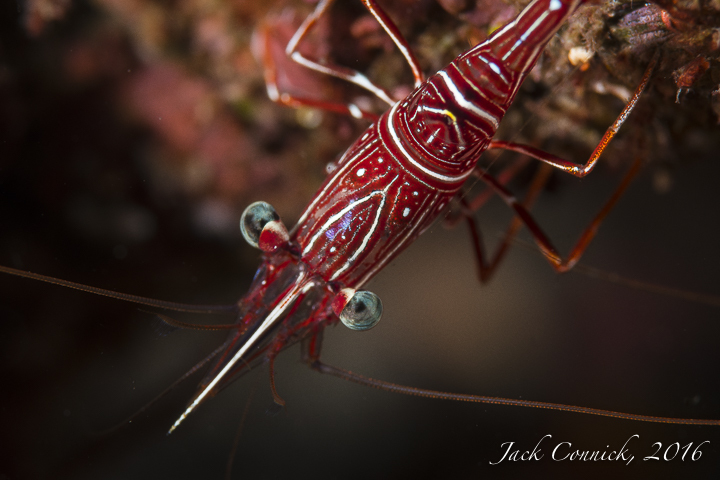 We came, we saw, we took photos, and more and more photos of an amazing variety of small underwater critters at Lembeh Straits, Indonesia in October of 2017 on the Optical Ocean Sales Photo Expedition there. Lembeh is an area centered around the town of Bintung, at the north end of North Sulawesi Island. 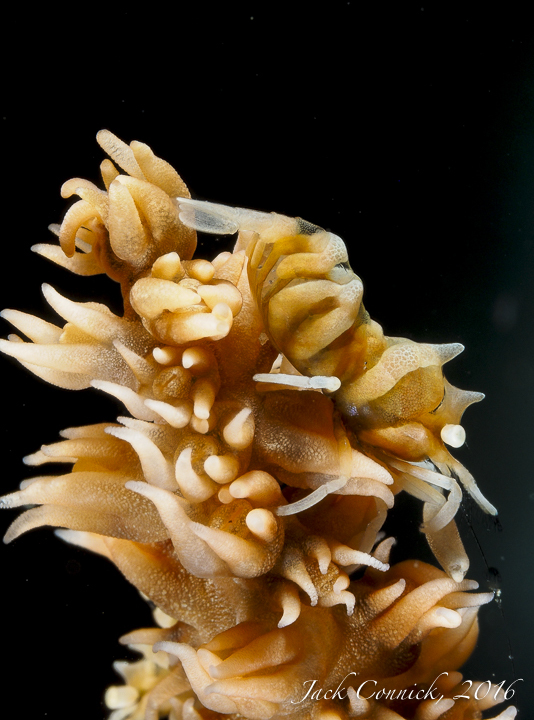 With 8,000’ deep drop-offs nearby, pumping huge amounts of plankton into the area, it harbors and fosters one of the highest bio-diversities of marine life found anywhere on the planet. 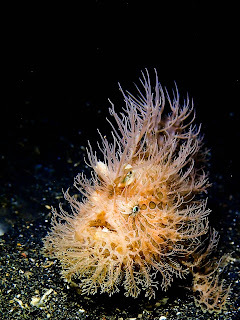 Staying at the lovely, new Dive Into Lembeh Resort at Hairball, our group of 16 found so many unique animals in our viewfinders that it was hard to keep up with the amazing sightings. It seemed like everything we discovered was a “Pigmy” or “Hairy” as well; Pigmy Filefish, Seahorses, Cuttlefish; Hairy Frogfish, Octopus, Shrimp - all found their way onto our memory cards. 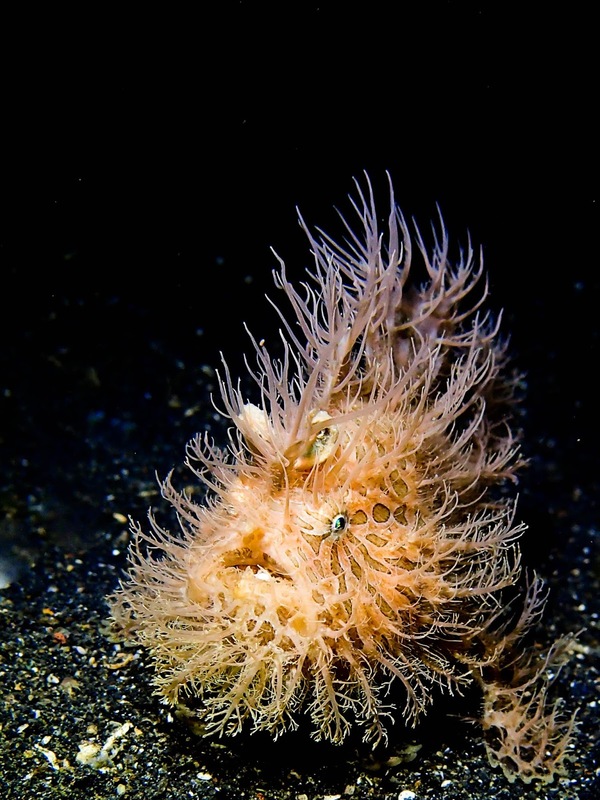 Small, delicate, and incredible, there were amazing finds on almost every dive. 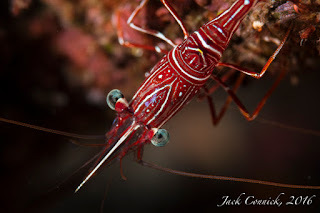 Lembeh Straits is truly a macro photographer's paradise. 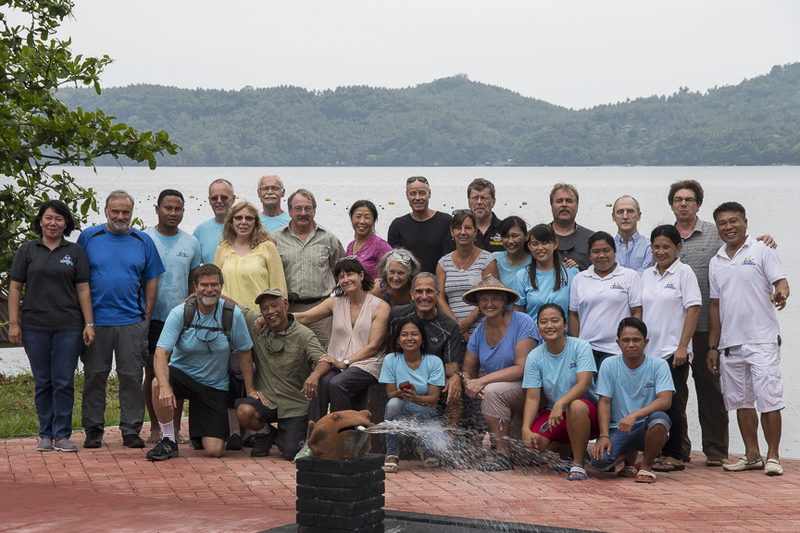 Dive into Lembeh is a new resort from the same folks who run Dive into Ambon, and has been designed for comfort amidst the jungle-like setting of North Sulawesi. 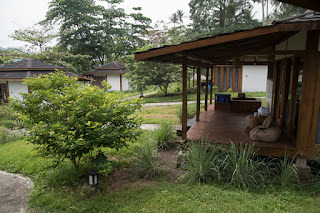 We were two to a cabin, scattered along the sloping landscaped waterfront, with a beautiful pool, spa and dining room. The bungalows were spacious and well-designed, with plenty of room; a large queen or two single beds and roomy bathroom with walk-in shower. Although luxurious, we were reminded where we were when a humongous jungle spider greeted us from the mirror during our morning shave, or bats flew through the dining room having their dinner along with ours. But coming back from a dive, we could jump into our cabin’s heated Japanese onsen soaking tub and all concerns melted away. Our huge amount of camera gear demanded good facilities, and we were not disappointed. The camera room and rinse tanks were well laid-out, with individual stations and large table with plenty of room to spread out. Our group enjoyed helping each other, sharing tools, tips and help, along with gear and stories of the “that’s nice, but I got one that’s better” conversations. 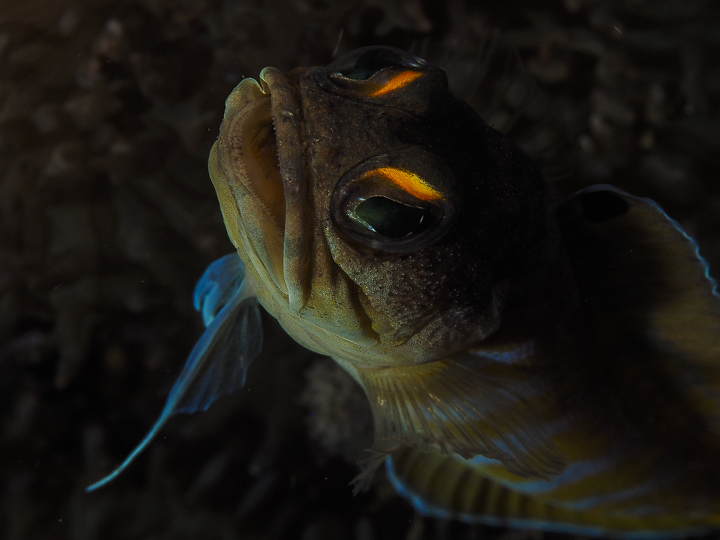 Jealousy raged, replaced by pride, in what each photographer accomplished during their 12 days of diving. Diving was from the resort’s three new dive boats, which were fast and comfortable. No dive site was more than 10-15 minutes away. The diving center has a nice dressing room and separate gear rinsing stations. The dives were well-organized and run, and all the resorts along Lembeh have an agreement not to have more than two boats on a site, so that we could enjoy our dives without feeling crowded. Our guides were experienced and had the “eyes of an eagle”, finding the tiny “pigmy” animals that none of us could see without careful attention to what was pointed out to us. 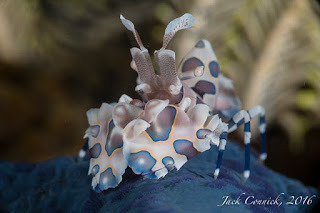 They also knew where some rare animals lived, such as the beautiful Harlequin Shrimp, color matched and perched on the blue starfish they love to eat. All of the guides were careful not to disturb, move, or offer us un-realistic animal situations. 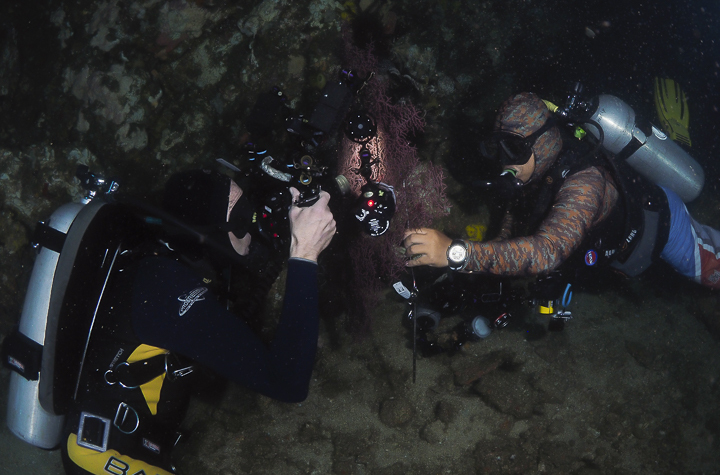 Even though I’ve done previous diving there, I was shown new and interesting sites, caves, walls and drift dives along the walls. The house-reef Hairball has an interesting flat area melting into a nice wall along the shore. 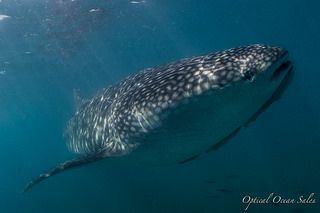 It offered plenty of good diving and was also a good night-dive, with easy access from shore. We had to be careful getting out of the boat, as some large seahorses were resident right at the boat moorings! About the only negative to the diving was the large amount of trash in the water. At low tide it was a thick mass, and I surfaced once with a large wad of plastic and paper wrapped over my head. I have to admit that while I enjoy shooting macro photos, I do love shooting wide angle just as much. With a little prompting, a few of us had our guides take us on some nice drift dives along Nudi Retreat and Nudi Falls to take photos of the beautiful, colorful walls there. 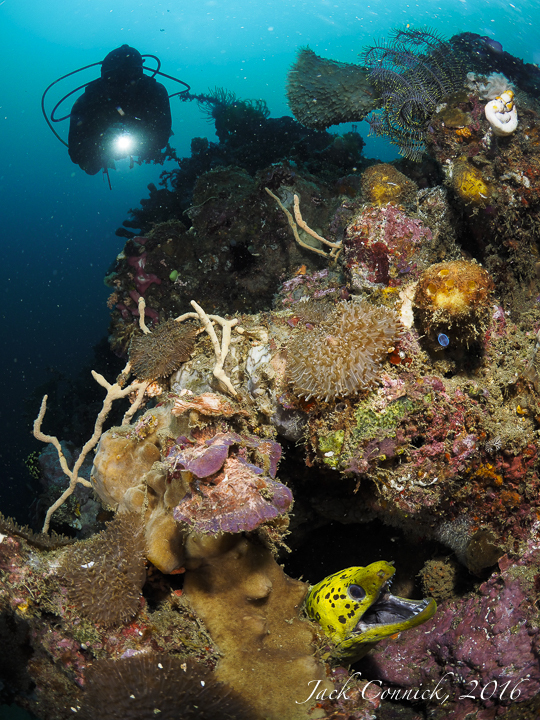 Soft coral, anemones and other invertebrates of every hue hid fish and other small critters that gave us opportunities to to test our wide angle photo skills. 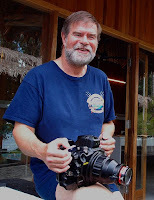 I was shooting two different camera rigs: a new Nikon D500 DSLR in a Sea & Sea MDX-D500 housing, and an Olympus E-M1 m 4/3rds SLR in an Olympus housing. The D500 has an amazing macro platform with autofocus, bright viewfinder, and low-light abilities that are perfect for this type of shooting. 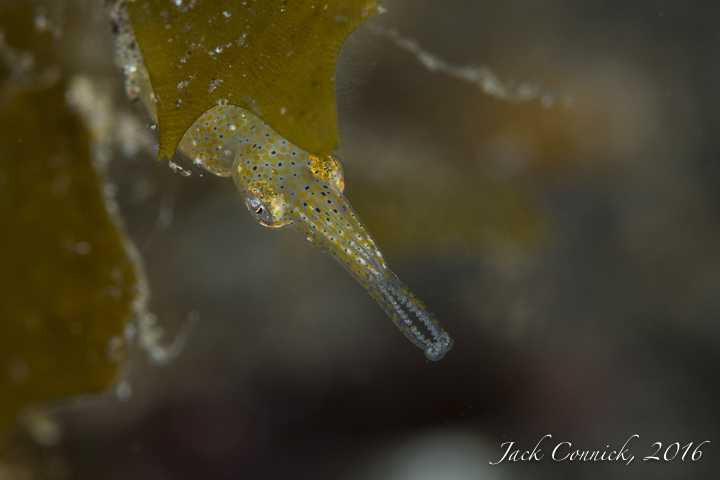 I found it wasn’t hard to capture multiple shots of a baby squid in focus with its proboscis darting in and out to feed on plankton. It is extremely fast to use, with its quick frame-rate and fast release, but it takes some getting used to, as the menu setup details on it is different than any other Nikon DSLR I’ve used before, from D80 to D800. It is much more electronic, and in my opinion, a cross between old-school DSLRs and the more electronic mirrorless SLRs like the E-M1. I believe in shooting the best tools available, even if it’s a non-OEM configuration. I had setup the Sea & Sea MDX-D500 housing with a Nauticam 180 viewfinder, along with a flip macro diopter holder, diopters and a SagaDive 100mm dome port. I used the Nikon 60mm, 105mm VR, and a dive or two with the Tokina 10-17mm FE lenses. The MDX-D500 housing was a prototype, and the new version of Sea & Sea’s optical strobe trigger wasn’t available yet. With some testing, I was able to use a trigger from a D7100 in manual mode, which certainly beats using an electronic sync cord. Controls were laid out fairly well, although I didn’t realize there is an adjustable 3 position shutter release, which would've helped if adjusted. I would also remove the AF lock button, as it’s not necessary if you set up the “lock button with press” in the menu. I liked the “glow in the dark” control labels. Overall the Sea & Sea housing performed very well and was comfortable, fast, and easy to setup and use. My friend Jeff was using his new Nauticam D500 housing, and one thing that happened to both of us was that even the very slight pressure of resting a finger on the shutter release would cause the photo review to not work. It was frustrating, until we figured it out. You definitely want to find another finger resting position than on the shutter release on the D500. The Nikon D500 shoots great video, and I set the rig up with a Kraken Sports 5000 lumen video light. It was easy to switch between stills and video. The quality of the footage with the Kraken’s bright white light was excellent - if I could keep it in focus - not easy with a macro lens. I’d use some sort of tripod next time. I also shot the Olympus E-M1, and I have to say it was surprisingly fast to shoot. It auto-focused quickly when used with the Kraken 5000 as a focus light. Shutter release on it is slower, but along with accurate D-TTL exposure with the Sea & Sea YS-D1 strobes, I got quite a few keepers with the sharp Olympus 60mm macro and an external +5 macro diopter lenses. When we dove the walls, the Olympus 8mm FE PRO lens showed its stripes as a stand-out, high-quality wide angle lens. It allowed me to set up subjects in the foreground and background amidst the colorful environment and get all in focus and working together. While trying out all this gear, I made some mistakes and ended up with some low-key, dark shots. The more I worked with them, the more I liked their dramatic quality with only a few details showing the essence of the animals. Always wait to evaluate your images on a larger screen than the camera’s - you might be surprised.